Application Performance Management (APM) in the Digital Enterprise enables IT professionals to be more successful in managing their company's applications. 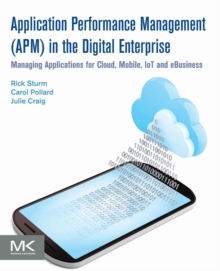 It explores the fundamentals of application management, examines how the latest technological trends impact application management, and provides best practices for responding to these changes. The recent surge in the use of containers as a way to simplify management and deploy applications has created new challenges, and the convergence of containerization, cloud, mobile, virtualization, analytics, and automation is reshaping the requirements for application management. This book serves as a guide for understanding these dramatic changes and how they impact the management of applications, showing how to create a management strategy, define the underlying processes and standards, and how to select the appropriate tools to enable management processes.